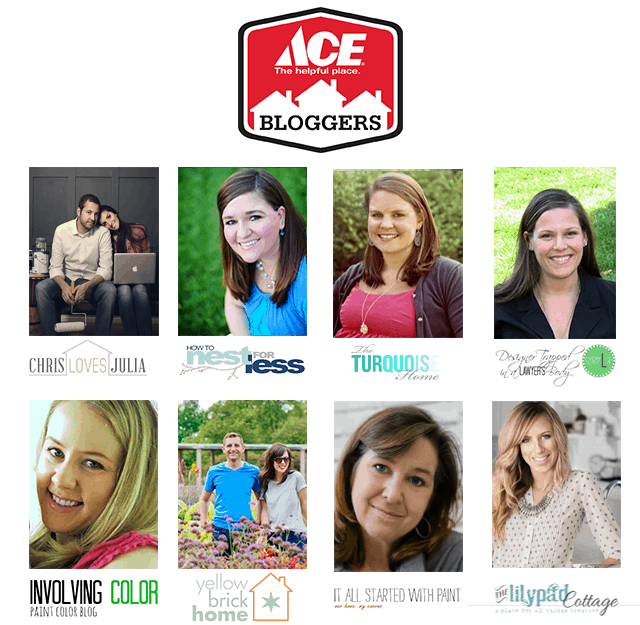 So I have some exciting news today… I’m officially part of the Ace Hardware Blogger Team! Well since getting help at Ace is like going to your neighbor, I decided my first project would be to help a friendly neighbor cross a project off their to-do list. So what came to mind? 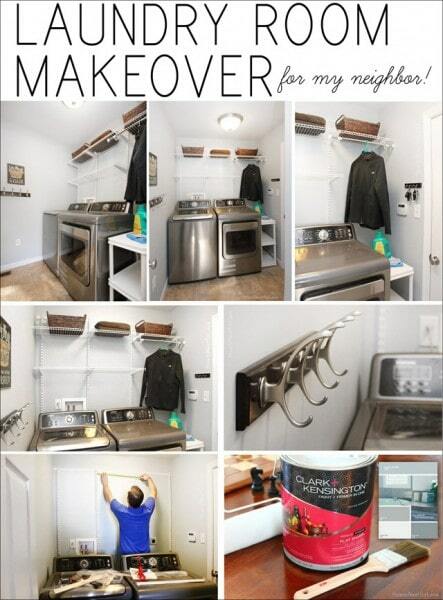 Helping a bachelor guy friend spruce up his laundry room with some storage and organization. First for the paint. I chose the color Lucky Charm by Clark+Kensington. Kind of a blueish gray tone. 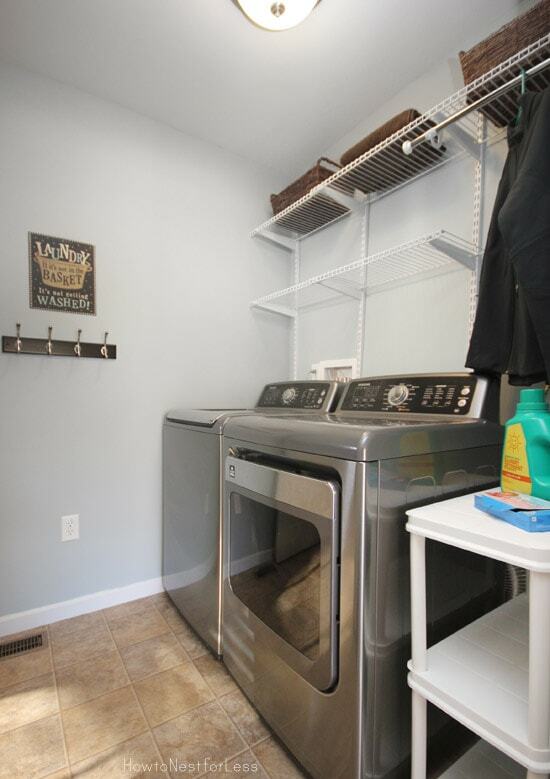 Manly enough for a bachelor’s laundry room I think. 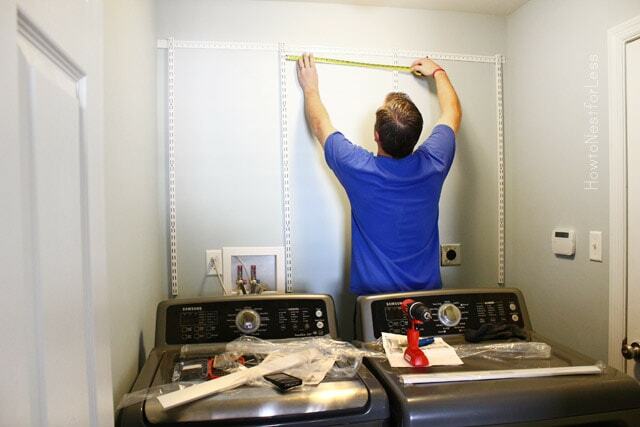 Since his laundry room didn’t have any shelving, I purchased a closet system from Ace Hardware to put above the washer and dryer. 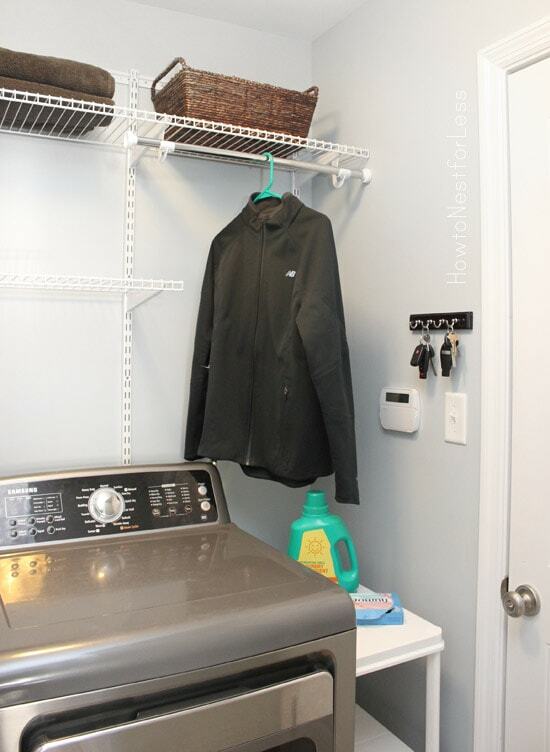 Next I put up some hooks for my neighbor’s coats, bike helmet, and little hooks for his keys. 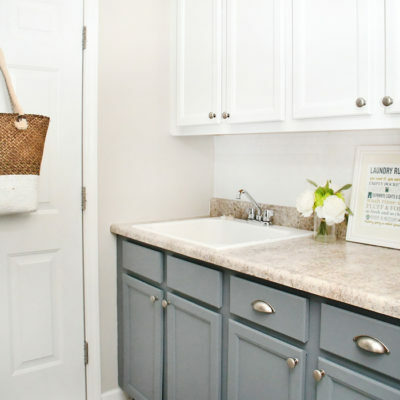 And I found a cute little laundry sign and baskets from a local craft store to complete the look. And here’s the before and after! 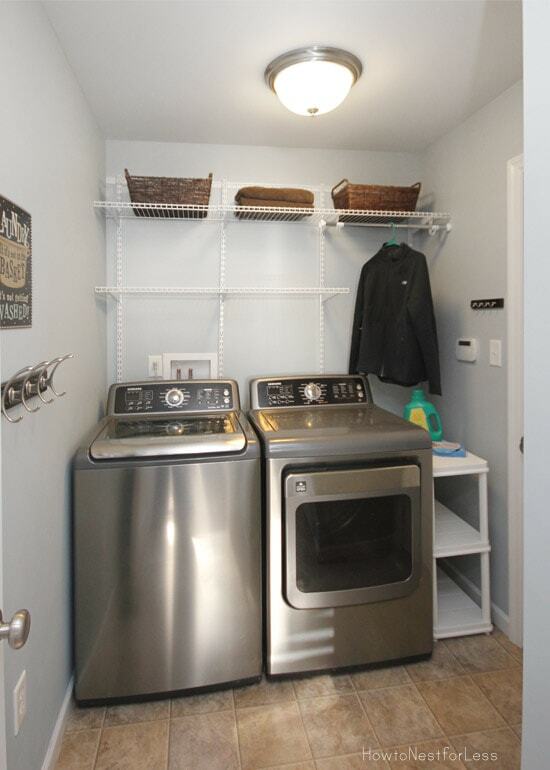 I did two rows of closet shelving, plenty of space for the baskets, extra towels, and anything else you can think of to store in the laundry room/mud room. I tried to stick with more manly colors: gray, dark brown and blue. 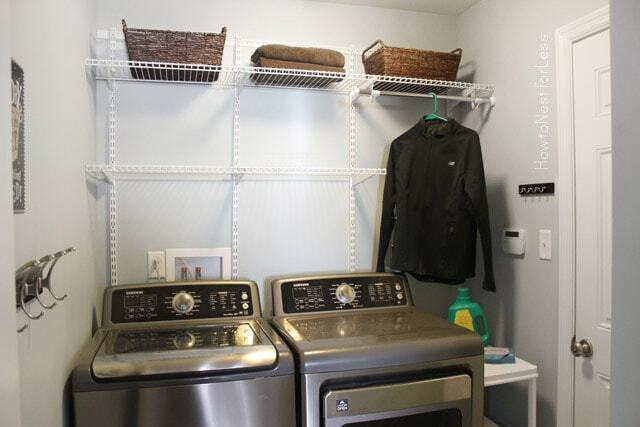 Next to the washer and dryer is a little cart for laundry detergent and other supplies. 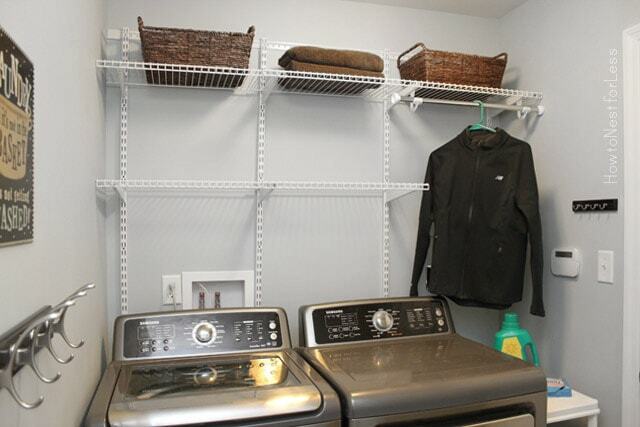 Another bonus with the closet system: it came with a rod for hanging clothes. 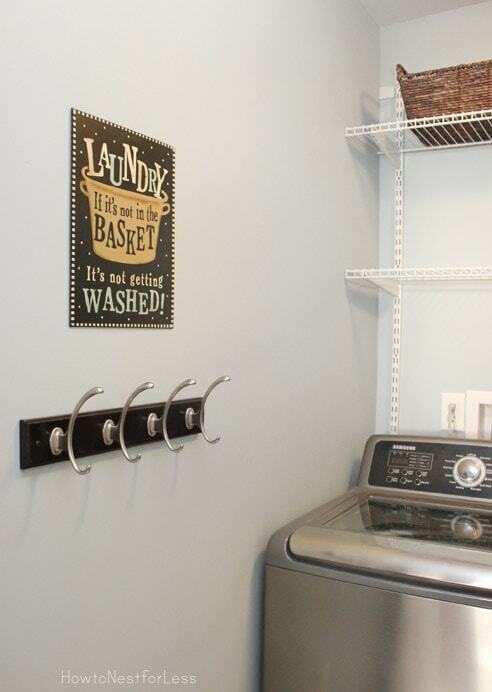 Great for those items that can’t be thrown in the dryer or clothes just back from the cleaners. Overall, more storage than my neighbor could ever ask for! And quite a change for a 4-hour project (including paint and installation). You did a great job, Erin! A big difference, but you didn’t go overboard with colors and frou-frou stuff that a guy (esp. a bachelor guy) would hate. Two thumbs up! 4 hours? WOW! Looks amazing. Perfect for a guy, and tons of room to expand too. Great color choices too, Erin! Great upgrade!! Love the new color and all of the storage!! Great job! (Congrats too!) You win the best neighbor of the year award! lol Love the color and I bet he’s loving the organization! I love it! 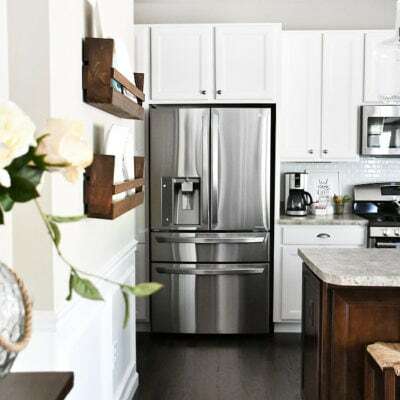 The colors are perfect, and I’m digging the adjustable closet shelving– very clever! Oh, I know! JEALOUS. I need that set when we move into our new home!! Wow – this looks awesome. I just love clean and organized spaces. You did a great job – wish I was your neighbor! 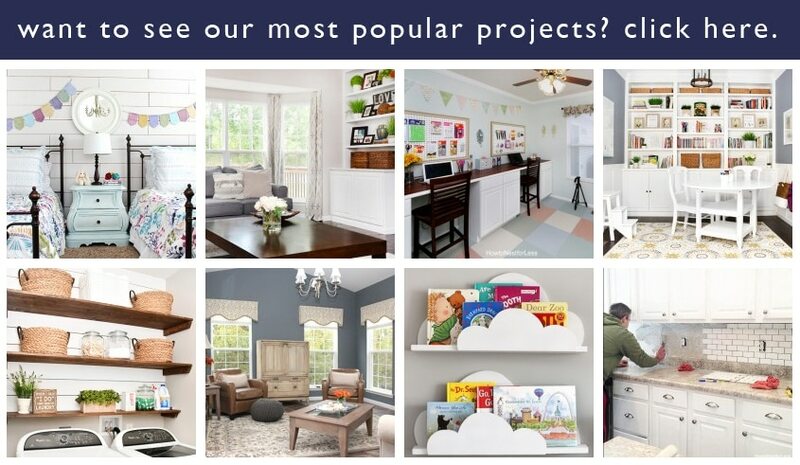 Congrats on the Ace Hardware blogger thingy – you sure deserve it! Perfect — and perfectly manly! Great job, my friend and fellow Ace Blogger! This looks great Erin! Love the color choice. 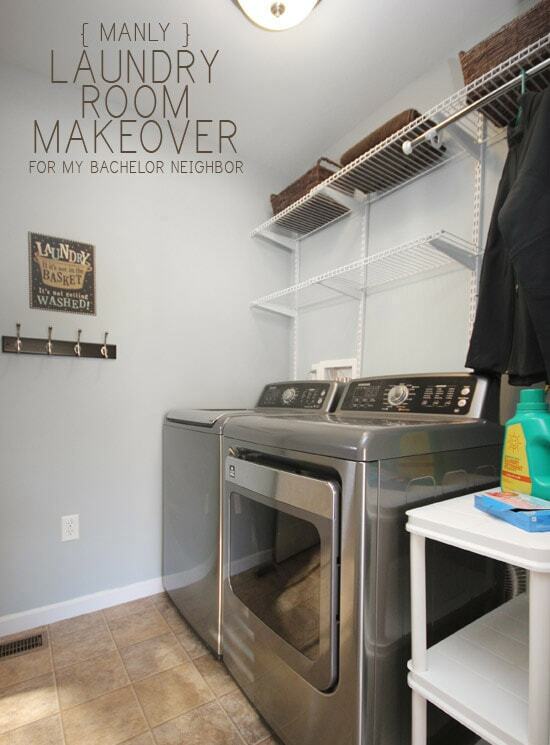 Can you tell us about how much you spent on the makeover? Looking to do something similar myself! 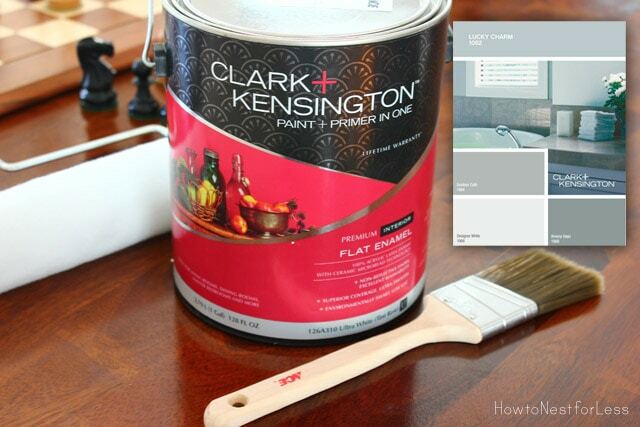 Clark+Kensington paint was $30 and painting supplies about another $10. 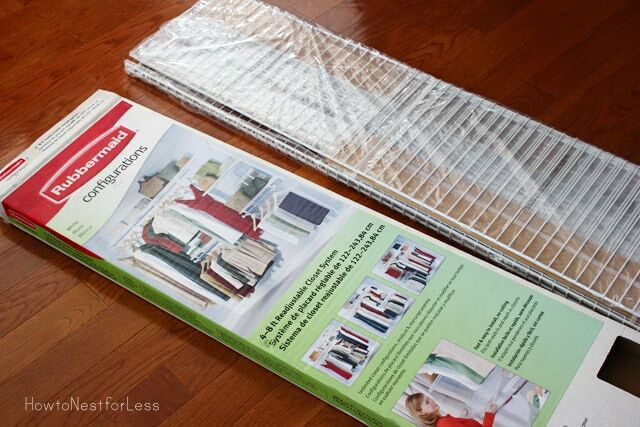 Closet wall system was $130. 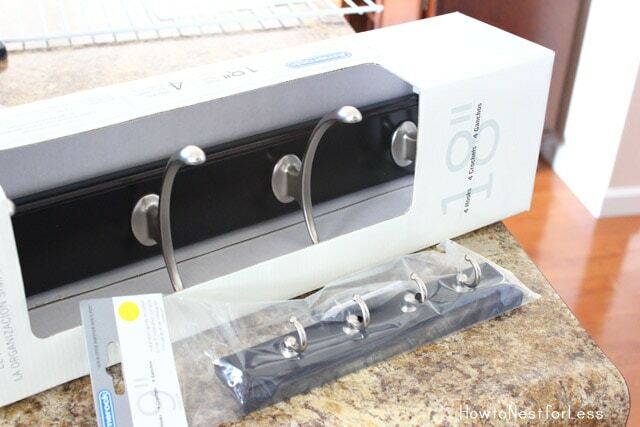 Hooks were $30 + $15. 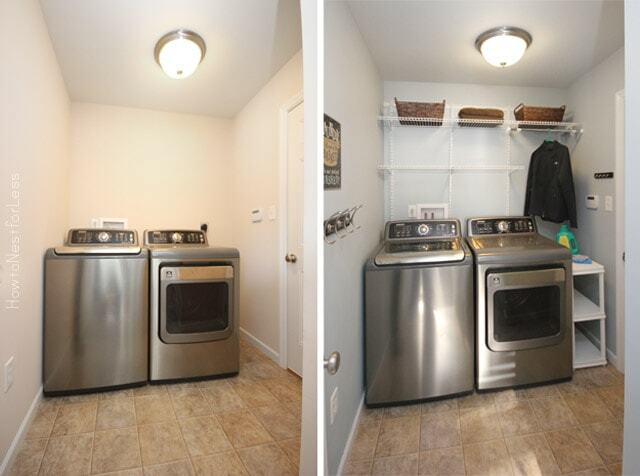 White shelving on the side of the washer/dryer was $30. 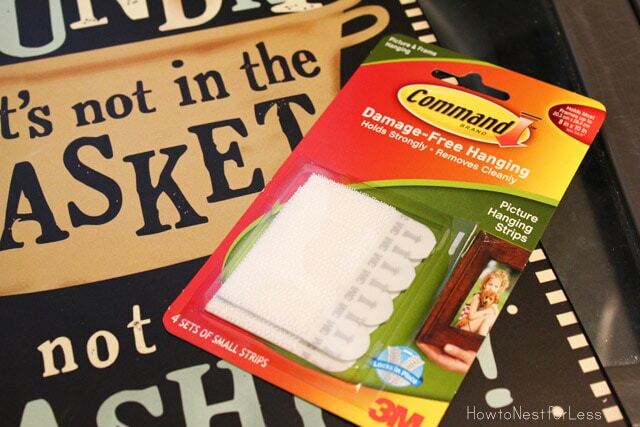 Then the baskets, wall sign, Command Brand strips, etc. The closet system is well worth the money though and comes with tons of shelves and rods that we can always add on later! I wish you were my neighbor! 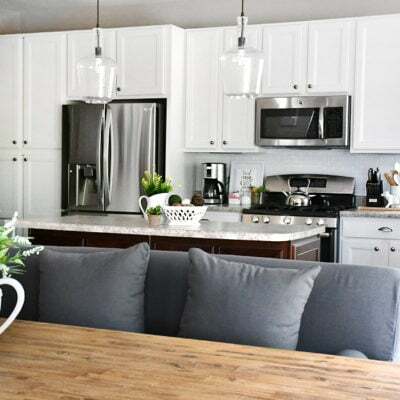 :-)I love the paint color with the stainless steel appliances. 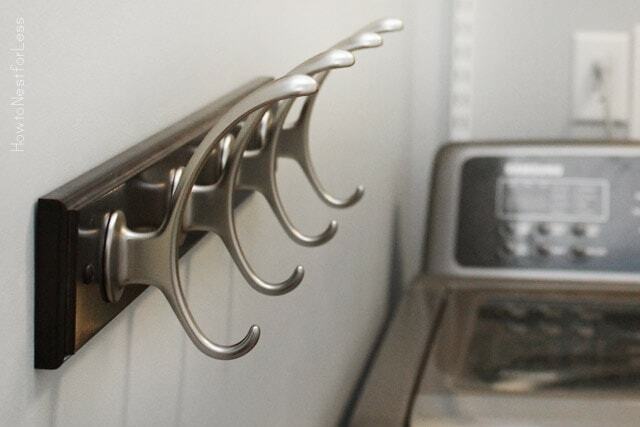 And I think the hooks look very masculine. You did great! Where did you find the sign? Love it. “CHEAPER” It didn’t cost me that much. Also, who puts a thermostat in a laundry room? The one thing I might have added is a retractable clothesline for big heavy things that get wet and can’t go in the dryer (like parkas or wool coats). 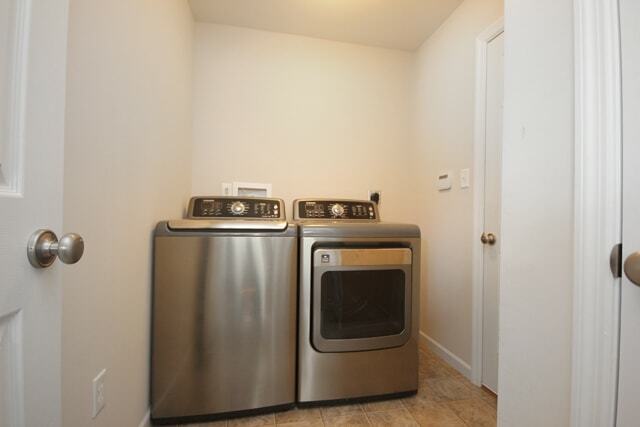 I suppose a guy would just throw such things in the dryer anyway, though.